When it comes to carriers in the US, no other network operator caused a stir like T-Mobile did. Rumblings began early in the year as LTE networks started popping up, then came the onslaught of Uncarrier phases. From 1.0 through to rumors about Uncarrier 4.0, it’s been a crescendo of changes made by Tmo in the hope of changing the way customers think about mobile phones and plans. It’s working. 2014 is fast approaching, and while we don’t know exactly what’s up Legere’s sleeve, it’s worth looking back on this year’s biggest articles on TmoNews. Starting from number 10 and counting down to the most popular article, here are the most viewed posts of the past 12 months. Leading up to a change of plans came a leaked piece of internal information showing that a Value Plan would be launching in the company’s retail stores from March 24th. These plans replaced older Classic Plans, although third party retailers would go on to offer the Classic variety. Before iPhone made its way to T-Mobile officially, over a million customers were using unlocked models and were stuck on EDGE speeds for doing so. A leaked carrier update information page suggested that would change, and obviously made big news earlier in the year. 8. 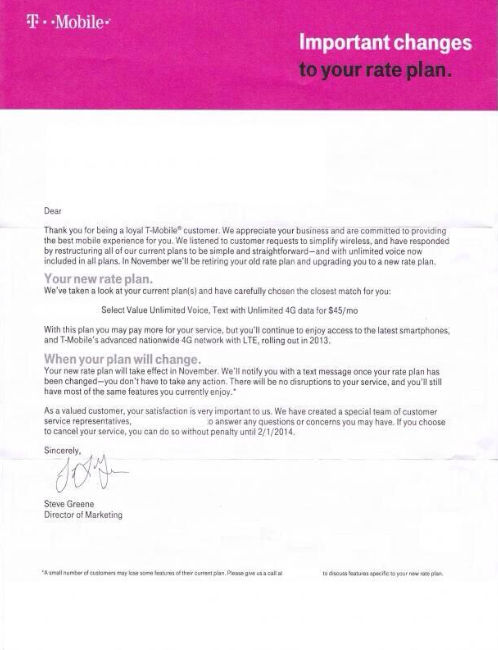 (Updated) T-Mobile Moving to Cancel Some Grandfathered Rate Plans, Offer Customers New Options? Although the news broke a couple of months back, this is still one of the topics I get contacted about most. T-Mobile announced (or didn’t announce) that it would be attempting to move customers on old plans over to newer, more up-to-date plans. In most cases, it would be better value for money. But, not everyone’s received “the call” yet. 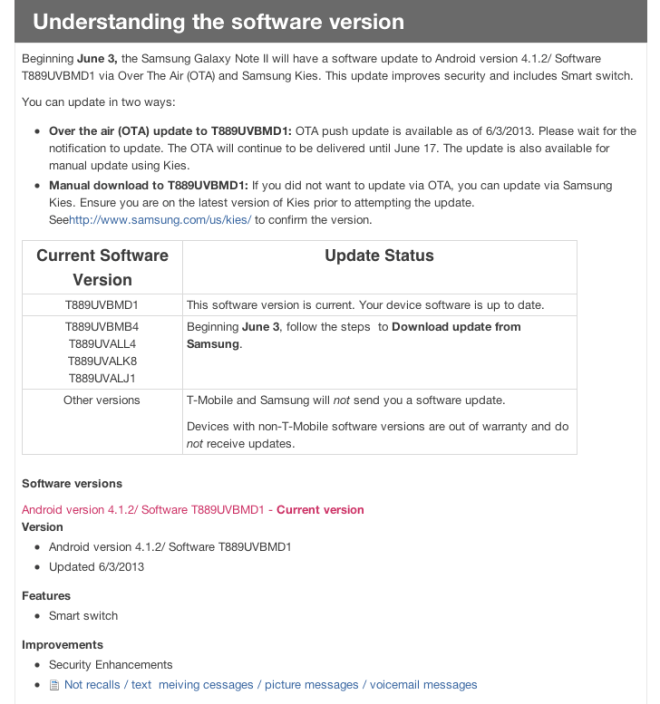 Sadly, with T-Mobile’s devices, there’s a tendency for software updates to be delayed when it comes to Android devices. It’s not rare that a software update makes big news, and back in June, one of those stories was regarding the Note II and its new security software features. One of which was a Smart Switch. The most recent piece on the top 10 list has only been published since the end of November and has already made its way in to the list of most viewed articles all year. 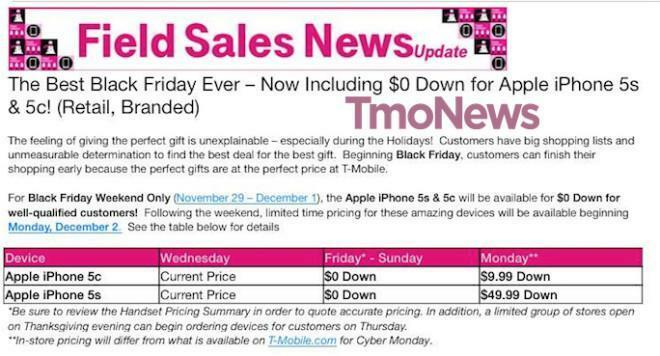 Before confirming its holiday deals, we received information that T-Mobile would be selling iPhones on a $0 down offer. Apple’s new iPhones were the biggest story of the tech industry this year, and yet, even though T-Mobile would be carrying them from the outset, pricing wasn’t released immediately leaving many to wonder how much they’d have to pay as a down payment to get one of Apple’s shiny new smartphones. From the perspective of T-Mobile fans, one of this year’s biggest highlights was the Uncarrier movement. Ending the subsidy method of phone pricing and focussing on great value deals. We broke down those plans to get a better look at exactly what Tmo was proposing. Before the holiday deals, in fact, before summer had kicked off properly, T-Mobile launched an impressive $0 down offer. It included all devices from July 27th. Anyone getting a Simple Choice plan would be able to take advantage. 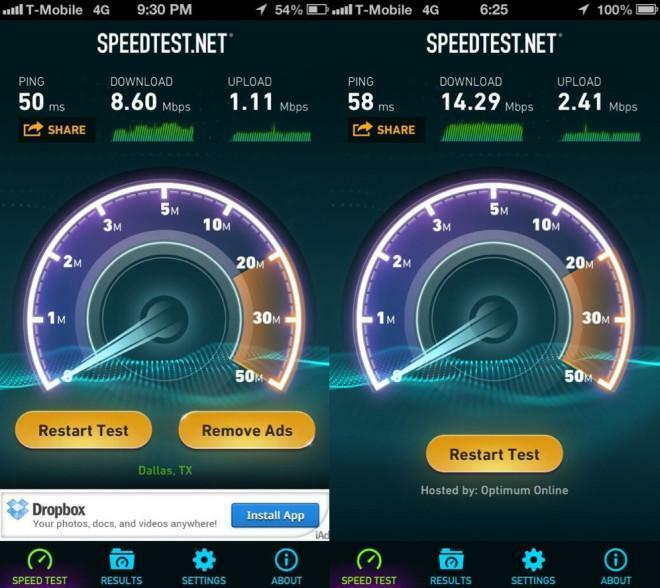 One of this year’s biggest stories was a workaround that allowed GSM iPhone users to boost their speeds. Especially if they were using Tmo’s 1900 bands. 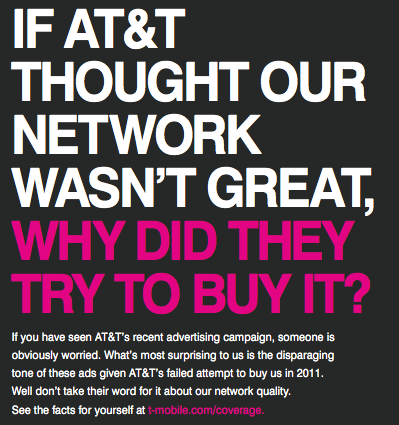 Earlier in the year, AT&T had a pot-shot at T-Mobile “revealing the truth” about how poor the network was. In response, T-Mobile pulled off its most entertaining marketing in a long time. It was fantastic to watch. Anyone notice that Cam didn’t wish us a merry christmas! That’s offensive! Not everyone celebrates Christmas. I didn’t see him wishing us Happy Hannukah. 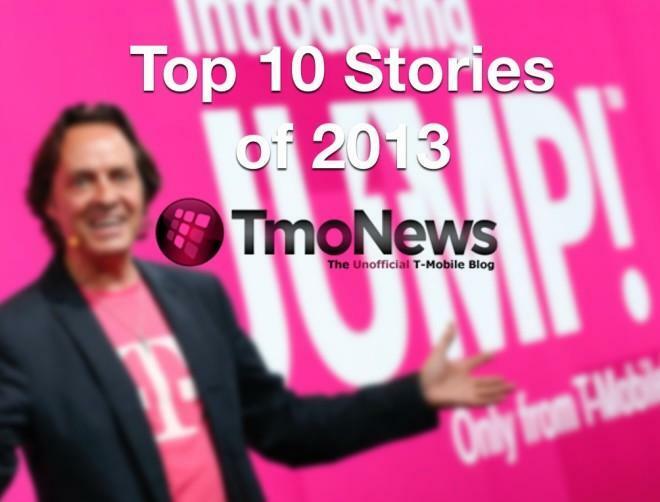 I would say that the website changing leadership would be the biggest TmoNews story, albeit not on the biggest T-Mobile stories list. Cam doesn’t care about this website because he probably has a full-time job somewhere else and this is just a part-time job (hobby) for him. Does Cam know that tmobile’s individual plan starts at $50 per month? The graph 10. on this article is a preliminary rate plan. Why is the most recent rate plan not in this article? I don’t care about seeing an ad in between articles or however but PHONEDOG needs to start monetizing from this website so that they can pay decent amount to someone so that they can take care of this website. Dude there was no news at all regarding T-mobile anywhere! What do you want Cam to do? Write some BS stories just so you can read something everyday? You know what, I take back my previous comment, because honestly you can’t read one bit. This is a Top 10 stories for the year. 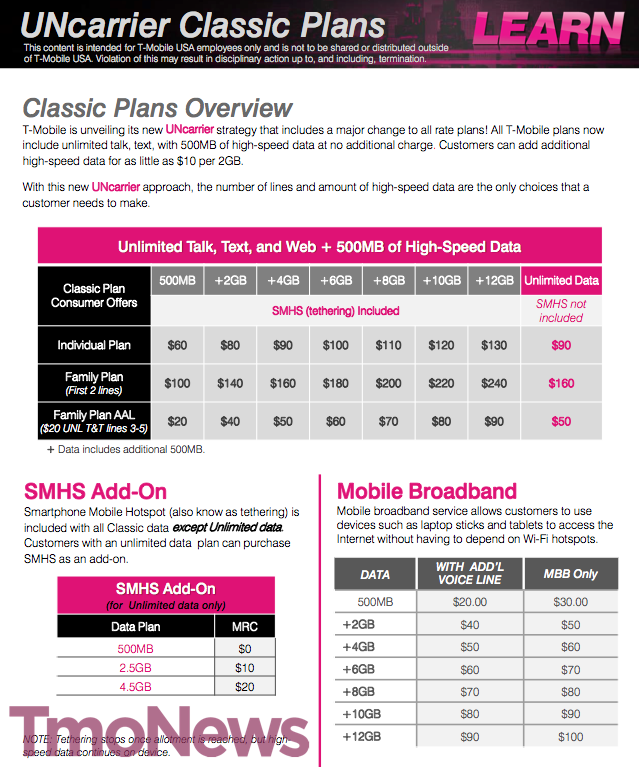 Earlier this year, when T-mobile first did the Uncarrier, the Classic to Non-Classic switch wasn’t directly to Simple Choice Plans. Simple Choice plans were not introduced until later half of the year. So the graph was right based on the time it was released. 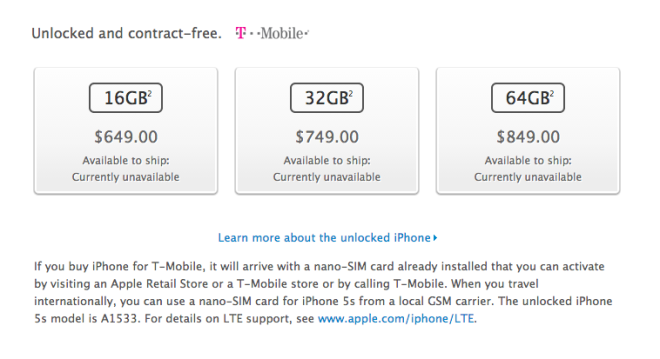 The number two new story for the YEAR is that iphone 5’s can get a speed boost on refarmed spectrum, with three and six as the T-mobile “sales”? All you folks complaining about this article and the coverage here since David left care to look back at the same period this time last year? David posted just three articles between December 27th and December 30th. One of which was “The TmoNews Top Ten Stories of 2012″…The list is determined by the number of hits each article received, not by what the author thought was the most important. You could look at the year before that as well and see the same article. I think it is not just quantity what has people a little upset. I’m going to go out on a limb here and say I feel you do a pretty good job posting articles that are interesting even when there isn’t much news to report. That said, I do feel that the quantity and quality of leaks and breaking information has decreased over the last year. I don’t think that has anything to do with you (Cam) or David before he left, I expect Tmo has just cracked down on leaks. Not much you can do about that. Also, how about showing Windows Phone some love? Some of us (all three of us WP users) just don’t care about iPhone or Samsung’s latest gimmick. Keep up the good work and have a great new years! It feels like you’re right about the drying up of leaks over the last year. I had already thought that Cam was maybe suffering, as any new editor would, because he didn’t have the same contacts and sources that David had accumulated over the years. But if you think about the stuff that used to get leaked in the bad-old-days, compared with what gets leaked since Uncarrier started, I think there must be a more positive attitude in-house which naturally discourages leaks. That said, I’ve detected the whiff of a possible issue both here and in the TM forums about the way TM are handling the migration of legacy plans to Simple Choice. It may be nothing, but if TM are screwing over some customers in that process, then it needs to get exposed. Uncarrier has to mean sweeping away the old culture of traps and deception. The amount of infantile comments comparing Cam and David is just astounding. It cannot be compare it. The is a huge difference. Over the two months leading up to David’s departure there were just over 100 stories posted. In less than two months since David posted his final farewell, there have been over 90 stories here. The latter period has covered Thanksgiving and the Christmas holidays which are typically slack times any year. One of the consequences of Uncarrier is the simplification of the TM workspace: there are fewer issues to talk about as a result of wholesale simplification in the plan structure, the cessation of Classic plans in national retail channels, the ending of subsidies, as well as an hiatus in the network modernization program while TM completes further spectrum acquisitions. Maybe the changes in this reporting environment were part of the reason that David left? Please POUND SAND with your crying about David! 1) HE SOLD THE PHUCKING WEBSITE!!! 2) He did THE ULTIMATE IN CAREER SUICIDE! He QUIT WITHOUT NOTICE! This sounds like cam in disguise. It doesn’t. It’s just when it goes quiet over holiday periods. The site’s direction hasn’t changed one bit. I cover the same stuff we always have, but as soon as I slow down a little to spend time with my family and news slows down, the haters come out to play. I don’t think it is about quantity. Some could be, but it is not all of it. How can you accurately cover Tmobile US while living in UK? Post some more stuff Cam Bun Ton or find someone from the U.S that cares and knows more about Tmobile. just keep posting to your todaysiphone where no one visits and comments on your articles. TmoNews and TodaysiPhone are completely different sites. 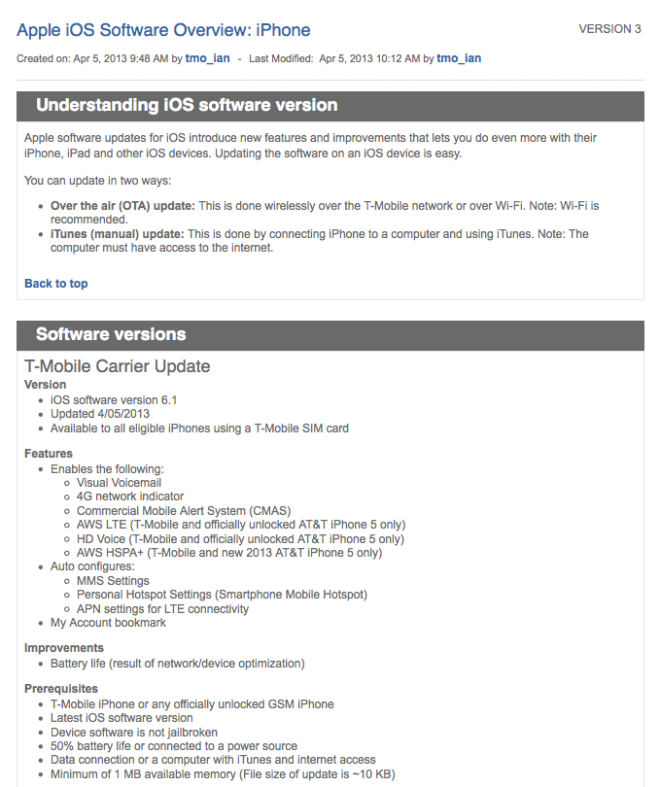 A T-Mobile site is never going to have the same quantity of posts as an iPhone blog. It’s always been that way. Comments have also never been a big deal over there. Normally TmoNews posts 2-3 per day, TiP is between 10-20 depending on the amount of news. It well be interesting to have an article about the recent takeoff of the T-Mobile stock which went from 29 to 33 dollars. It will be interesting to see why. Those who bought the $25 are winning. There have been two articles here related to the cause of the stock price increase, which is the reported plans by Softbank (who already own Sprint) to buy Deutsche Telekom’s 67% holding in TM US. The second article addresses unconfirmed reports that Softbank and DT are already in the final stages of the talks. Between the two articles there have been over 400 comments and several have referenced the fact that the share values for both TM and Sprint have taken off as a result. I have read those articles and did not notice. Perhaps needed a closer look. Thanks for the answer. T-Mobile screwed tens of thousands of its customers, cutting of their plans and not giving them the plans they were promised, and T-Mobile refused to make it right. Not necessarily. He may not have articulated the issue clearly enough yet, but there is a discussion going on in the TM forum right now about how customer service reps are denying the existence of the letter David reported some months ago, which addressed the migration of some legacy accounts over to Simple Choice plans. If this post is related to that subject then it needs to be explored and, if it proves to have foundation, the issue needs to be exposed. I didn’t say he didn’t have a valid point, simply that as far as I’m concerned, making a post to complain when it will have absolutely zero effect on an article that has nothing to do with the issue makes you a troll. It might be a valid point, but that post was unnecessary and contributed nothing. It would be of more use on T-Mobile’s forums as T-Mobile reps will actually see it there. We obviously have different definitions of the term “troll”. I take your point about it not being directly relevant to the story in hand, but this would be quite a big issue, if it proved to be related to the migration letter and current allegations that customer service are denying its existence. Since only the moderators can initiate topics here, and since a number of posts (including this one) have contained complaints about the absence of relevant TM content, if I were a moderator, I’d be inclined to allow this enough rope to generate a story of its own, should the facts support one. The problem with limiting it to the TM forum is that, if the company is consciously reneging on the offers made in that letter, then it doesn’t matter how many TM reps see it, they will all have the same response. That’s where sites like this come into their own. As it happens, I’d already submitted this as a potential story through the “Submit News” link, so I have to declare an interest. His point is relevant to story #8 featured in this post. You’ll need to elaborate on this some more. Which plans were cut? Which plans were promised and then refused? Is this anything to do with the letters that were reported to have been sent out to some legacy plan subscribers a couple of months ago about moving over to Simple Choice plans? I find it hilarious when people act so indignant at the possibility of DT selling TMO … as if DT should conduct a survey of TMO customers lol! If you dont want sprint, let’s start a Kickstarter campaign to raise $20bil to buy out DT! Only $500 per TMO sub. Lol. I see nothing wrong with consumers expressing concern about how a regulated service industry might change as a result of supply-side consolidations. It would be great if everybody shared a common understanding of all the facts, so that the discussions could focus on real issues rather than unnecessary fears, but that is never going to happen so we have to live with the consequences of widely ranging topics, sentiments, and opinions. The fact is that there have been federal statutes for well over a hundred years protecting markets from the consequences of monopolies, and – over time – these have given a voice to consumers so that they can influence these issues without having to resort to the impossible option of becoming a competitor themselves. Whether you are a TM customer or not, everyone is entitled to express an opinion about an issue that will certainly determine how the mobile marketplace will evolve for the foreseeable future. What regulated service industry are you referring to? The wireless industry is not a regulated industry. If it isn’t regulated, what the neck is the FCC, and why do they have to approve all use of wireless spectrum? Of course it’s regulated. No, airwaves are a crucial scarce resource and conflicting uses of the same frequency causes interference which is why the airwaves are regulated. The FCC doesn’t just exist for the purpose of regulating airwaves, however, they also oversee actual regulated industries such as cable and landlines. In a regulated industry supply and demand is controlled by the government but production/operation is done by a private company. so, basically, what I’m saying is that the wireless industry is not a regulated industry, but it uses a regulated resource. I think you are mistaking the extent of applied regulations in the wireless industry with limitations on the extent of the FCC regulatory capacity. The fact that they have chosen to impose fewer strict limitations does not mean that the FCC are powerless to do so. While your example of the electric utilities describes one form of a regulated industry, it also involves a regulated market which is not the case with all regulated industries. For example, I would expect you to recognize that the pharmaceutical industry is a heavily regulated industry, but operates its market in a completely different way to utilities. At the very outset, the FCC says of itself that it “regulates interstate and international communications by radio, television, wire, satellite and cable in all 50 states, the District of Columbia and U.S. territories.” That is sufficient for the wireless industry to be termed “regulated” in the sense that I was intending. Good suggestion. might be the best way to deal with DT exiting the US Market. Then tmo will be the peoples network. I just can’t believe that Legere is that stupid. Sprint over the last few years has done everything in their power to hose their customers, suppliers and partners. Their reputation on the street in the US is worthless. Their attitude toward their customers, speaking from DIRECT experience, is so bad that if their equipment or services or personnel cause you direct harm, they couldn’t care less. Their network is AWFUL. Their rate structures are lunacy. Their whole business model is based on what they can do next week to tighten the screws on their customer base even harder. This is NOT what Legere signed up for. He’s proven over the last year that he’s got stones the size of grape fruits but having to adhere to Sprint’s ‘way’, even if SoftBank says he’ll be autonomous, is over the line for him. He has slapped around ATT and the other predators in his business pretty well but SoftBank will turn the screws on him and he’ll tell them to pound sand as he walks out the doors. Then TMO craters. Finally realized why Cam – living in UK – acts like he cares about TMO remaining an independent company: no more Tmobile means no more tmonews means income goes down! There’s already a kickass sprint site – s4gru – and they have someone inside Sorin giving them the rollout schedule.